Although the Nepalese people are clear about the major political party of CPN-Maoist, the party is still a mystery for non-Nepalese people. The Maoist leaders have made people in Nepal familiar with their motives and agendas through political campaigns, personal contact, the publishing of their opinions in newspapers, magazines, pamphlets and commitment letters and the airing of interviews on television. Only a few mass media organizations that publish or broadcast in English carry the message to foreigners. But these seem to be guided by a status-quo mentality. They have given space to Maoist issues abundantly; however, the opinions they carry about Maoists are often derogatory, doubtful and undermining or mystifying. The opinions expressed in these articles and editorials are much often more critical than they should have been. The Maoists are still mystifying. Maoist leaders are struggling harder to build up their reputation internationally than they are within the country. 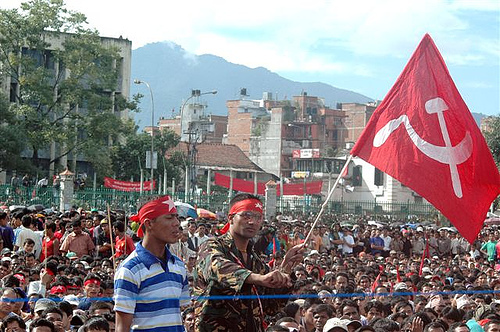 Federalism is one of the basic agendas that the Maoists have set for the reconstruction of Nepal. The demand of the Constituent Assembly election has been most successfully fulfilled. However, the international community has not whole-heartedly reported the fact and the Maoists have yet to be credited for the achievement of the CA election. Unexpectedly, the CA election was accomplished peacefully. This was surprising to the international community because by the time of the election Nepalese elites had vomited so much through the English medium media organizations about how the Young Communist League (YCL) would never let the election be peaceful. The same elites are now questioning, from teatime chats to newspaper columns, whether the Maoists can run the government. They do not believe the Maoists can lead the country. They say the Maoists are inexperienced and so on. And this is what the international community sees. But foreigners are perplexed by what they read and see and what the reality on the ground has turned out to be. They have begun to find the Maoists more reliable than the English-language columnists. The Maoists have become the nation's largest party and most probably will become its ruling party. So it is time the Maoists were shown to the outside world differently. It is time they were demystified. The pundits should rethink the status quo and their traditional attitudes about the changes. They have already been proved wrong in the eyes of international community about the election. Now they are making another mistake by questioning the Maoists' ability to establish the rule of law and bring economic prosperity. Their time would be better spent arousing positive hope for the changes. They should encourage the international community to believe in us and spread the hands in mutual cooperation and help.